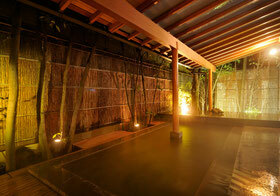 Kona Onsen - A Historical Spa - Shoheiso, traditional hot spring hotel, onsen ryokan, Izu Nagaoka Onsen resort. 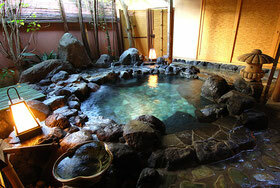 The hot spring in the hotel is from Kona Onse, a historical spa since the Heian Era over 1000 years ago. 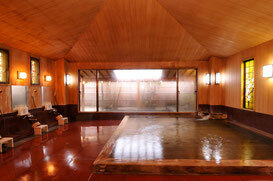 The hot spring water is a natural lotion that makes the skin smooth and soft. It is also effective for easing joint pain and muscle pain. Soaking in the cypress indoor bath built from an ancient 2000 old tree, or the outdoor bath surrounded by greenery can make one feel relaxed physically as well as mentally. 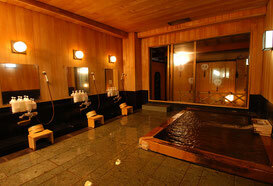 Big public baths "Fujikoubai-no-yu" and "Fujihakubai-no-yu" can be enjoyed by all guests. Please note the hours for male and female are different. 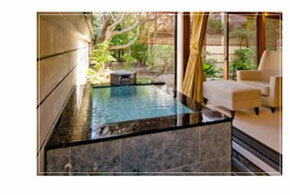 The outdoor bath is a relaxing place where one can unwind in a hot spring bath surrounded by nature. The wall is built from Kyoto Kitayama cedar, and the bathtub is built from materials mixed with charcoal to produce negative ions. The outdoor rock bath is filled with Izunagaoka Kona hot spring water. It is a quite and relaxing spot. The bath in Shohei Suite is a glass-walled room with air-conditioning and TV. Guests can enjoy a bath anytime in any weather. This is a modern style bath filled with Kona hot spring water. 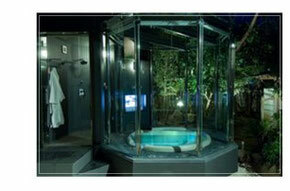 It is a 24-hour private bath. 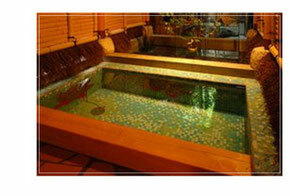 This is a comfortable hot spring bath built with Venetian mosaic glass.